Battery Nokia BL-4C with capacity 860 mAh Li-ion Bulk. .. Battery Nokia BL-4CT with capacity 860 mAh Li-ion Bulk. .. Battery Nokia BL-4D with capacity 1200 mAh Li-ion bulk. Nokia Battery BL-4D is a lightweig.. Battery Nokia BL-4J with capacity 1300 mAh Li-ion without packing. .. Battery Nokia BL-4U Asha 311 with capacity 1000 mAh Li-ion Bulk. .. 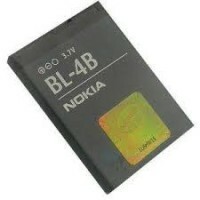 Battery Nokia BL-5B with capacity 760 mAh Li-ion bulk. .. Battery Nokia BL-5BT 2600 Classic 870 mAh Li-ion bulk. .. Battery Nokia BL-5C with capacity 1020 mAh Li-ion Bulk. .. Battery Nokia BL-5CA with capacity 700mAh Li-ion. .. Battery Nokia BL-5F with capacity 950 mAh Li-ion Bulk. .. Battery Nokia BL-6P with capacity 830 mAh Li-ion. .. Battery Nokia BL-6Q with capacity 970 mAh Li-ion bulk. .. Battery Nokia BLD-3 with capacity 720mAh Li-ion. .. Battery Nokia BP-3L with capacity 1300 mAh Li-Polymer bulk. ..